Also, since this recipe is super easy, you can put the kids to work making it while you put the finishing touches on Thanksgiving Dinner! It’s a great way to get them involved in the kitchen. 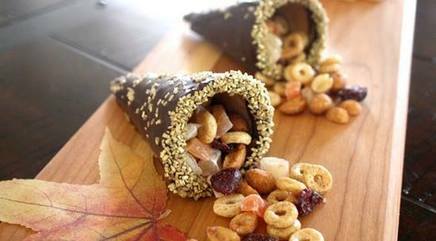 First, start by making your cornucopia “filling”. I used Cinnamon Burst Cheerios, honey roasted peanuts and mixed dried fruit. You can get creative as you want (or even use this opportunity to clean out the pantry). The Cinnamon Burst Cheerios are a great base for most flavor combinations! Mix your ingredients in a medium bowl … let the munching begin!